Most styles of training encourage you to “help” your dog, relying on leashes and collars to guide and control actions and on verbal commands to direct behavior. The longer I train dogs, the more convinced I become that words, equipment, and other attempts to “help” actually interfere with animal learning. I believe real learning takes place only when you give your dog the opportunity to learn how to learn. If you try to help him or correct him, you aren’t giving your dog a chance to learn on his own. Your dog is quite capable of figuring out how to get himself rewarded; simply give him a chance! If you doubt this, think about how little time it took him to discover the sofa, find the leftover beef on the kitchen counter, or pull on his leash. Dogs aren’t verbal creatures. They don’t use words to communicate. Their “language” is far subtler and relies heavily on non-verbal signals. Because humans use words as a primary wayto communicate, as soon as we provide the information or give a verbal instruction, we assume it’s been understood. That assumption usually works fine if we’re talking to another person who shares our language and culture. We get into trouble when we assume the same thing has happened with our dogs. 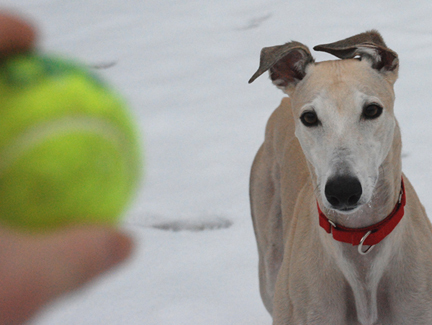 Because humans are so verbal, we try to help by giving a training behavior a name. When it’s named, we assume it’s learned. We talk too much! We repeat behavior cues over and over before the dog understands what we expect and before we give him a reason to respond. Using words too soon or too often renders them meaningless. When you teach a new behavior, your dog quickly picks up on your body or hand positions. Those become his first cues or signals. You may think he’s listening to you, but what he’s really doing is watching you. Take advantage of that. Once you introduce a verbal cue he doesn’t have to look at you. Don’t make it easy to ignore you. Two other advantages of using physical cues: we don’t tend to keep repeating them, and we can’t raise our voices or use angry tones. Both encourage learning. So how do you help your dog learn how to learn? Start by teaching him to watch you, because this is where all the good stuff happens! Help him by starting with simple behaviors that aren’t likely to be part of his history. Let him know when he does something you like by using a signal like yes or a click followed by a reward. Reward what you want. Ignore or prevent what you don’t want. Of course, if you want to catch him doing it right it means you have to pay as much attention to your dog as you expect him to pay to you. How do I use this nonverbal approach to train a behavior? Let’s say I’m ready to teach down. I may use a bit of really tasty food held at my dog’s nose then moved slowly so his body follows it to where I want his body to go. If I use a food lure I get rid of it very quickly — usually after only three or four successful attempts — because I want him to focus on learning, not food. I then simply move my empty fingers the same way I did when I held the treat. The movement of my hand in that way becomes a cue to lie down. If his nose doesn’t follow immediately, I do nothing. I don’t say the cue nor do I use the physical cue again unless several seconds have passed. If I feel I must, I try a lure again, but mostly I shut up and wait. I let my dog think about it. Eventually he’ll offer the behavior, and when he then gets rewarded he truly begins to learn how to learn. So my best advice on helping your dog “learn how to learn”? Learn to shut up and wait for it.